Jim Harrang, BS ’48 (philosophy), LLB ’51, died December 11, 2017, at 94. Photo: Harrang rappelling from Mount Washington’s Red Saddle in 2000. What would a Duck from Foster, Oregon—who years later would join the first group to summit 10,497-foot Mount Jefferson in winter—do when hearing that a militant political dictator was intent on expanding his control to encompass all of Europe? That Duck would join the 10th Mountain Division, a group of US soldiers trained for mountain warfare. He would dress in white and, near the end of World War II, scale a vertical precipice in the Italian Alps to defeat enemies who had left their “inaccessible” flank unprotected. About 50 years later, that Duck returned to his old training grounds in the mountains of Colorado, his right shoulder recently torn by a vicious oar that had hooked into a rogue wave on an eastern Oregon river. The Duck, undeterred, wrapped a belt around his waist, chained his useless arm to the belt for protection, and skied the 10th Mountain Division trail in the steep and stormy Rockies. He skied hut to hut for miles and miles, four days at 11,000 feet, food and sleeping gear on his back, wearing wool pants retained from the war. Who was this 75-year-old who skied the steep slopes on fish-scale skis with no metal edges and one arm disabled? It was Jim Harrang, lover of the outdoors, benefactor to his university, friend to his community. Tackling that four-day trail was just one manifestation of his tireless commitment to a bold, active life. In 1961, Jim Harrang, a lawyer in Eugene, and UO psychology professor Ray Hyman began to jog with others every day at noon from the old Esslinger gym at East 15th Avenue and University Street—now the university Student Recreation Center. The “noon group” ran for fun and even trained for marathons. They ran in baggy, gray-cotton sweatshirts and sweatpants that the UO bestowed on faculty members with gym membership. These bulky garments became heavy and cold when soaked on drizzly January days, but that didn’t slow Jim down. 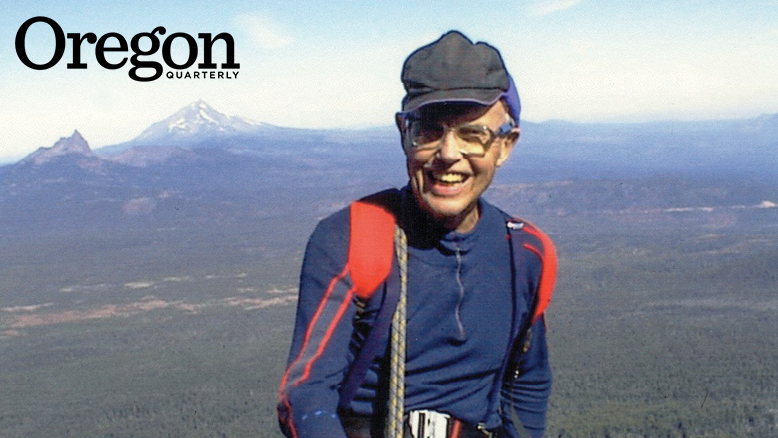 In 1988, in his 60s, Jim and the authors of this story set out one July day to run a 21-mile loop around Three Fingered Jack, the 7,844-foot volcano northwest of Sisters. We loped through fir forests, traversed scree-covered slopes, and circled back to the Pacific Crest trailhead. When we finished our run, we rested a few minutes, our spirits high from the elevation, exertion, and sense of completion. But on the way back to what we thought would be Eugene, Jim took a right-hand turn toward Sweet Home, soon pulled to the side of the road, and parked. We scampered down the steep slope to a rock ledge high above the South Santiam River. Jim stripped off his trail-running clothes and stood there—a skinny, naked runner poised above a river forced between two rock walls. John followed suit . . . well, without suit. “Jim,” he said, “you are 64 years old and have just run 21 miles. The river, no doubt, is freezing cold. Is this a good idea?” Jim answered: “I’ve been jumping from this spot for almost 60 years, and I’m not going to stop now!” In he plunged. And disappeared, swept downstream by the rapid current. There was nothing to do but join him. John jumped in and floated down to a half-cave, light dancing off the roof, reflected by the late-afternoon summer sun. He hung on to the hope that Jim would know how to get out of this crevasse in the rocks. Of course, Jim did. He could do anything. John Postlethwait, a professor of biology, studies genetic regulation of animal development, including development of the nervous system. Paul Slovic, a professor of psychology, studies judgment and decision processes, including decision-making under conditions of risk.